Details: Kohala ‘Aina Festival is an annual benefit concert and celebration of local harvest, small farmers, and the vibrant movement for island-wide food sovereignty. Held each year at the beginning of the Makahiki season, the festival features a superb line up of international and local musicians, educational workshops, organic food vendors, and several family friendly keiki activities. 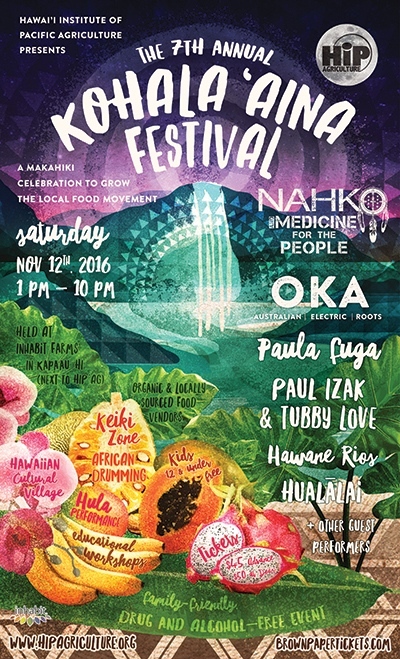 We are so pleased to welcome back the world-renowned Nahko and Medicine for the People,Tubby Love, and Hawane Rios, with new additions to the lineup this year including OKA, Paula Fuga, Paul Izak, and Ka’ahele. Tickets are $45 in advance, $50 at the door, and children 12 and under are admitted free. This is a family-friendly, drug, and alcohol-free event. All proceeds from the event support the three core pillars of HIP Agricultures programming: Residential Farmer Trainings, Youth Education, and Community Events and Workshops held throughout the year. We are honored and excited to bring the 7th annual Kohala Aina Festival to our community, elevating the consciousness of the island, supporting our local food economy, and serving our community through education and empowerment.